Yes, she was an absolutely horrible guard dog, and would sooner lick you to death than do damage to you. She had an affinity for licking Josh’s face – particularly after meals since the getting was good then. She was a huge mooch, and would stare you down with hungry eyes while you were eating until you caved and gave her something. Of her more lady-like qualities; she often burped, farted, and snored loudly, and she took up the whole dang bed. She liked to chew on my socks (not with feet in them), and I would find them soaking wet scattered around the house. Most people lose odd socks in the wash; I lost them to Lucy. 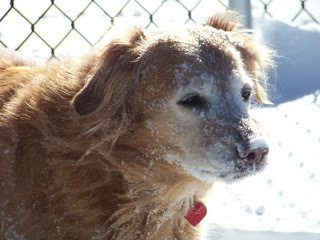 She did normal dog things too – she would play ball until my arm was tired, chased her tail till she was dizzy, and loved to burrow in the snow. She stayed a puppy as long as she could, but in the end she was just plain tired. Last night I knew the time had come to let her go, and to let her go peacefully. I helped her into bed with me, and tried to keep her comfortable as best I could. There were many times when our eyes would meet, and I knew she was saying, “Let me go Mom, I hurt.” Few decisions are harder, I think. 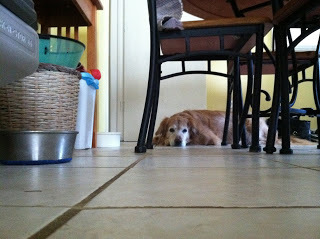 When her vet saw her today and agreed that it was time to let go, the guilt lessened some, but not the pain. I was able to hold her as she passed, and tell her what a great and wonderful blessing she was to us, and how much we will always love her. I owed it to her to be with her to the last, and be the last thing she saw. I know she’s no longer suffering, and that is small comfort right now. It’s hard to explain to Josh what’s happened, but I think deep down he understands. He was able to say goodbye to her this afternoon, and it broke my heart. He really loved Lucy, and I hope he can appreciate at least that she is okay now, and no longer hurting. He’s gotten teary eyed, but hasn’t outright cried. But then, he never does. I’ll just cry for both of us. We are honored to have known such a sweet soul, and will never forget you Lucy.